I’m sat rigid, my muscles steel rods, and I have no idea why. We were talking about my family and now I’m reacting to something the therapist said, but even seconds later I can’t remember what it was. Something is thundering through my innards. The longer we talk, the more I want to curl up. My legs feel vacuous. There’s a faint, queasy sense in my middle. On the edges of myself, I am shutting down: the dissociation that blocks out information before I’m even consciously aware of it. So I just sit, stiffly. I can’t look at her. I don’t want her to see me. These ‘voices’ weren’t always audible to me. I used to have memory blanks instead. I was either this part, or that part and never the twain would meet. Now, in what I am yet to realise is only the ‘middle’ section of therapy (being a third of the way through a nearly ten-year process), I’m tuning in to thoughts and feelings and impressions that previously had been silent. It’s deeply unnerving. It’s like a committee in my head – a committee that can never, ever agree. ‘What’s going on for you right now?’ she says, quietly and gently. It’s a trick she often uses, although I doubt she’s even aware of it: lowering her tone, going quiet, reducing the sense of threat. She’s the human equivalent of a horse whisperer. And in this state, like this, I feel strangely like a cornered animal. How can a simple question, in a therapy session, with a therapist I’ve been seeing for 3 years, be so threatening? I have no idea what’s going on for me right now. I sink further into myself, feeling a failure. I really don’t want to be here. I push myself to the fore. I need to rouse myself, because I am ashamed at the visibility of my shame. I need to hide it. I move myself in my chair and feel suddenly more present, as if I’ve reactivated the connection with my body just by moving. I sit forward, determined not to fall back into other parts of myself. Because although I want to retreat there, it also feels too vulnerable. ‘Shame?’ I say, my voice little more than a monotone. It feels an effort to get the muscles in my face to move. I feel a dull, thudding confusion. Come on, I say to myself, silently. I don’t want her to see me at such a loss. I’ve gone into analytical, adult mode to try to get a grip on the collapse of emotion on the inside of me. She knows it and sits back in her chair. We have this tacit agreement that analytical me wants more space, less intimacy. She’s playing along. We’re going to tackle this, for the moment at least, as if it’s some bug in a section of programming code. We’ll sit shoulder-to-shoulder and assess it. At no point will it refer to me. ‘Shame is …’ I’m wracking my brain. Come on, this information is in there somewhere. It takes huge effort to locate it because the pull to drift away is exceptionally strong just now. It’s like red warning lights are strobing along the surface of my mind and my instinct is to retreat psychologically – mental flight into another part. But I’m also learning to try to stay present, at least for a while. And I don’t want to draw any more attention to my distress. She’s weighing me up, trying to see how close to the edge I am. She is brewing. There’s something, evidently, that she wants to say. ‘What about shame towards yourself?’ she says. I look at her blankly. I have no idea what she’s talking about, and my face evidently says so. Membership of myself? I don’t understand. It will take me several years more to truly grasp this: how I need to belong, not just to a clan, but first and foremost to myself. It is the antithesis of dissociative identity disorder: the sense of belonging deep within yourself, feeling ‘at home’ within yourself, it being safe to be ‘you’. ‘What were we just talking about?’ I ask, focusing on the least threatening part of her last sentence. But I immediately regret it. ‘Do you not remember?’ she asks, a little superfluously. Obviously I don’t. And she knows it. But she’s prodding me towards the edge. I shake my head and feel that terrible lurching feeling in my stomach again. I want to draw all over myself with a magic eraser. ‘I can’t remember what’s happened when I’m in other parts!’ I say, a little angrily, but really just to try to deflect her. It’s like a warning shot across her bows, that I don’t want to go there. She is not to be deflected. I feel warm with a tiny flicker of rage. What gives her the right to say that? But I also know she’s right. Many times, she’s offered to talk about what other parts have said to her while I’ve been ‘gone’, and I’ve declined. I haven’t wanted to know, because at one level – amorphous, wordless, indescribable – I have known. It’s been like trying not to remember a particularly vicious dream, so looking away, turning the music up, cluttering my mind with busyness. I fall silent, heavy under this accusation, and yet also, strangely, feeling freed by it. Because somehow, in a way that I can’t yet articulate, there is hope in it. My dissociation is not as out of control as I tell myself it is. I could know if I wanted to know – perhaps not perfectly, perhaps not in the same way as rewinding and playing back normal life from yesterday, but in some shape and form. She’s absolutely right. I could know if I wanted to know. It’s exactly because I think it’s too overwhelming, too unbearable, too shameful, that I don’t want to know. The thought sits heavily upon me, like treacle on a sponge. ‘And therein lies the problem.’ She says this very softly, like mist landing on autumn leaves, and so somehow it doesn’t sting. There is an aching sadness now in the room between us. There aren’t words big enough to describe this feeling. It is a sense that I would rather be anyone other than myself. It is a belief that I am fundamentally and impossibly flawed, that I will never change, that there is no-one in the universe as unacceptable as me. It is an expectation that I must cling to the edge of the room because if I dare to take my place in the world, to show my face, to announce my arrival, I will be rejected. I am only allowed here as long as no-one notices me, as long as I don’t get in the way, as long I don’t need or demand anything. And here I am, in therapy, the centre of attention, full of neediness, grasping for connection, disclosing my feelings, daring to be. It is dangerous and mortifying and exquisite all at the same time. But I get my revenge each week by self-harming to restore the status quo. Only then is it acceptable for me to come again. The therapist doesn’t know this yet. It is one more shameful thing that sits in the space between us. That’s it, exactly. Of course I am. Wouldn’t she be? Wouldn’t anybody be ashamed to be me? It seems so obvious, a truth that has always been true. And even admitting it feels shameful, because I know the next step will be to challenge it and to try to change it. I steel myself. Time to be told off for being ashamed, I think. But she doesn’t. She sits with compassion creasing her face. Ouch. I hadn’t expected that. I hadn’t wanted that. I want her to hate me, and be cross with me, and chastise me, tell me how stupid I am for being so ashamed. Because that’s what I deserve. All session I have been feeling desperately alone. The metre or so between us has felt like a mile. Many times, I have thought that I would rather be on my own than alone in a room with another person, when connection is so close and yet so far. And suddenly, in that aloneness, her empathy has touched me, and I look at her – just for a moment. I look deep into her eyes, to make sure there’s no mockery there, and I allow the uplink to complete. ‘Yes’ is all I say, because I want her to know that I’m here now. The tautness in my muscles slowly begins to subside. I feel less on guard. Gradually I begin to soften, like she’s warming me in a pan. And then I sigh out my sadness. ‘I don’t want to hate myself so much …’ I offer. ‘I know,’ she says, full of sadness too. ‘But how can you even begin to not hate yourself when you’re so hateful? – when, intrinsically, deep down, you really are so shameful?’ This is the nub of the impossibility for me. The belief overrides all other options. She shuffles in her chair slightly, as if she’s been holding my tension too. ‘Your shame has served a purpose,’ she says, and she immediately catches my attention. I had always, and only, thought of shame as negative – the shame to be ashamed of. I glance at her, surprise furrowing my brow. My mind is reeling. As usual, I had only ever seen my shame in terms of me: this is truth, the badness of me, the defectiveness of me. I am self-evidently bad, therefore the shame is just a reflection of reality. But this idea flips that. So I stagger a little. ‘But it’s not helping me now,’ I counter, eventually, just because I feel I need to say something. What I really want to do – and what I will do – is go away and sit on my own and write down what she has just said and ponder it, alone, for days. Because that’s how long it takes for my brain to process anything. It feels like she’s edging back from my emotion, so as not to push me too far in one go. But it helps. There is space in my lungs to breathe. ‘What other strategy is there?’ I say, because I literally have no idea at all: shame is all I have ever known. She pauses and seems to be spinning through a rolodex of options in her head. ‘What about self-compassion?’ she suggests at last. Rush. It’s like a sudden avalanche, of terror mixed with disgust. I feel thrown back by the reaction and my body instinctively withdraws from her. I spit it out, like it’s maggoty apple. My muscles are suddenly ablaze and it’s all I can do to hold myself in the chair and not get up and run out of the door. I have no idea why I’m reacting but suddenly the therapist feels like a stranger and I don’t know if I can trust her any more. And then suddenly something breaks on the inside of me and I switch to a young part who’s sobbing and crying and all their hurt plasters itself across the room at the therapist. I stand somewhere at a distance, watching it, appalled, trying to look away. I’m not sure how long this outburst lasts. I’m not even sure it’s me. I’m not sure of anything at all, but when I come back into myself I have to sniff up my snot and my breathing is jerky and shallow. ‘Shame certainly feels like a safer option for you right now than self-compassion,’ she says gently. I nod blankly, not quite sure of what’s just happened, and certainly not sure of why. But we have uncovered something important, and I know enough by now to realise that herein lies the route of healing, however much I may wish to retreat. Shame has been my ally and my friend and I am being asked to switch sides. And evidently parts of me don’t yet feel that they can allow that. Suddenly I don’t feel quite so bad at feeling so bad. I hadn’t realised that it’s normal to be this reactive. I hadn’t realised it wasn’t just me. I prop myself forward, leaning on my knees. The chair I’m sitting on always seems to want to swallow me up, sagging me into its bowels, and I’m sure it contributes to my sense of stuckness. So I force myself slightly forwards. ‘It feels dangerous to let go of shame,’ I say at last, slowly and carefully, as if picking peas out of paella. I become acutely aware that right at this moment, battling with shame, I want to shield myself from the therapist’s disgust and displeasure. It feels like this great, vast expanse of badness on the inside of me, like a skate rink filled with black ice. And I’m expecting the therapist to spit at me. But she mirrors my body position, like she’s leaning in towards me. She seems to want to make contact with me. The thought makes me shudder slightly, with fear. ‘You’re using shame as a form of self-control?’ she clarifies. I want to say, of course it does, but suddenly I’m unsure. I feel stuck, not knowing what the right answer is, so I shrug my shoulders. ‘What might you be capable of if you didn’t shame yourself?’ she asks instead. Of course I don’t know. I have never identified it. It’s a nebulous dread based not in fact but in primal beliefs about myself. Bad people do bad things; I am a bad person; therefore I will do bad things. Shaming myself – the brutal, censorious self-deprecation of constant criticism and judgment upon myself – is the only thing that holds back vile atrocities. Obviously. Again I shrug. We are stuck in a Catch-22. Of course the therapist doesn’t believe how bad I really am: if she did, she wouldn’t let me come. I mustn’t tell her, or show her, or let her see. So she will never believe me when I tell her that I’m bad. How then to move forwards? But there’s something strangely comforting about her presence here with me even as I grapple with these thoughts. There’s something disconfirming about her whole way of being. And I see, in a sudden flash, that she is not my mother, and that she doesn’t hate people and judge them and write them off. There is instead everything in this moment that I have experienced all the time I have been in therapy with her – patience, generosity, tolerance, compassion. Could it be that she sees me differently to the way I see myself? I have failed to speak for a good few minutes now. Because everything I feel, and everything I am, seems beyond words. She trails off, perhaps wondering if she’s pushed it too far, or wondering if she’s not pushed far enough. How do therapists ever make these judgements? How do they ever get it right? The reflex strikes within me: like a punch in the guts, I recoil at the thought of loving this little part of me. To me, it is a wolf in sheep’s clothing. Appealing and charming to the therapist, I see it as conniving, manipulative, deceitful, narcissistic. It wants love. It would grab for it. It would cling to the therapist and never let go. It would scrape out every last shred of affection and attention and adoration and love. It would ruin it all. I hate it. It’ll get us into trouble with its craving for acceptance. It’ll turn people against us, lead us into a trap. With its need for affirmation, it’ll make us vulnerable to abuse. I sit feeling crumpled and lonely and confused and drained. I particularly object to the use of the pronoun ‘she’. We mustn’t be loved, comes a voice inside, desperate and fearful. It’s a strange voice, little more than a child’s, but it’s urgent and serious. And I realise that the badness that I most fear being capable of is the badness of looking to be loved. While I shame myself, and insist that I am immutably unloveable, I am trying to keep myself safe. I am trying to avoid ever being abused again. Because somewhere, at some point in time, somehow, I have taken on the belief that I caused the abuse by needing to be loved. I have no idea of its genesis, only that it takes the form of a self-evident belief. And if I shame myself continually, if I detail my badness, my unworthiness, at all times, then I can keep that part under control: and we will never, ever, seek to be loved, and we will never, ever, allow ourselves to be abused. There are many layers to my shame, but this is one of the thickest: the way I have needed to cast myself as the villain, to ensure that the love-needy parts of me don’t get their way. I ache now with the pain of it all. The therapist looks back at me, no doubt wondering what I’m thinking. I want to believe her. I think, actually, that I do believe her. But it still feels wrong. ‘If I hadn’t needed to be loved, I wouldn’t have been abused …’ I proffer. As the therapist bends her head in towards me to catch my words, I realise how quiet my voice has become. This too is shame. ‘… and it keeps you safe.’ She finishes my sentence with me and just for that moment I feel profoundly understood. I don’t know what she means, but I know she’s right, and I have a sudden rush of my own insight. ‘No.’ Sadness, like a shimmering of sand. What would it be like, instead, I wonder, to allow myself to be loved? For the moment I can’t get over how dangerous it still feels. But there’s a window, a tiny glimmer of light of a life-beyond. And I want to peer through it. Her ‘homework’ is par for the course. And she always expects me to do it. I nod. I am beginning to appreciate that the therapy hour is just the first card in the deck, and I have all week to deal them all. None of the things we touch on are resolved within the session. They are merely activated, and the principle work is in the gaps between sessions. How much I utilise those gaps is as important as what we do in the therapy room. But as always, the loneliness of the intervening week looms upon me, and I don’t want to leave. And it occurs to me that I do want to be loved: otherwise, why would I be here, and why would I want to come back? And so I do leave, and then I come back, and the process continues. And bit by bit I edge towards the belief that I don’t need to be ashamed of wanting to be loved. 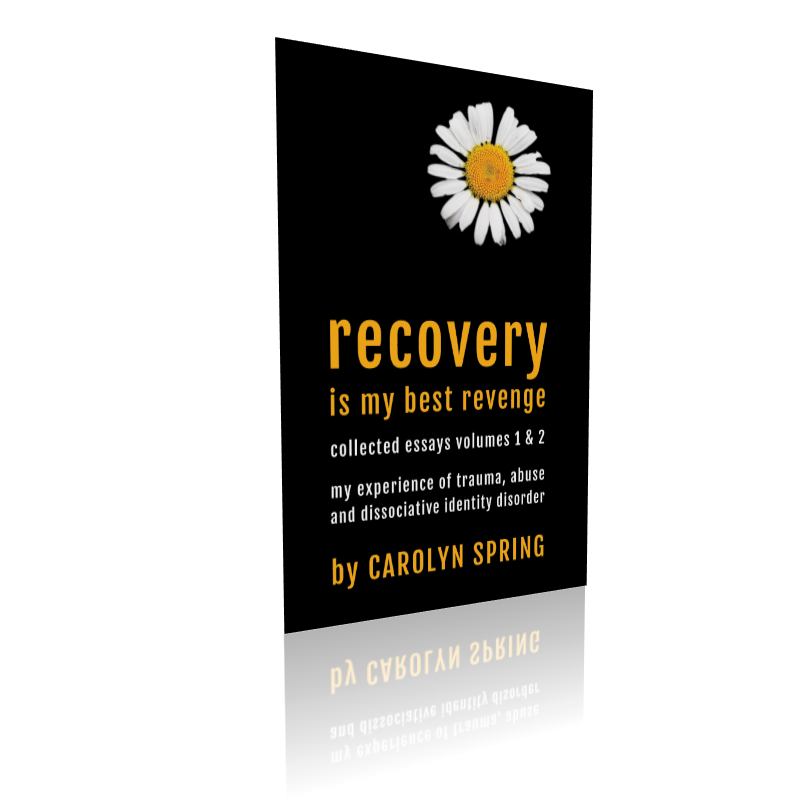 Carolyn, every time I read your blog posts, I wonder, have you been inside my head? Which then makes me quickly jump ahead to, so I do have D.I.D. then? If you feel and think all of these things and I do too… I know I have D.I.D. but of course parts of me revolt at that idea and each time I read something from you, it feels like tiny glimmers of hope. That I’m not a completely hopeless case, an abomination. Thank you, I appreciate your time and words more than I could articulate. Tears come as I read your writings. I work with a therapist who introduced me to DID 7yrs ago… like you some parts do not want accept, I don’t want to have it, it’s hard and so confusing at times. I have only ever shared it with one other friend, otherwise it is something I keep locked away. It is so helpful to read your words and identify with your journey, it makes me feel not so alone or ‘mad’. Why I don’t tell others is due to shame, I don’t want my past trauma to label me as ‘mad’. I feel so ashamed at who I am…. although there was nothing I could do to change what happened… I survived but at a cost. Caroline, as with all your written work, I feel you have written all about me. I find this very difficult at times as I find myself reacting as it is me and you touch my hurt and shame like no other. Your writing always stops me in my tracks, I relate to so much, I wouldn’t know where to start to tell you so just want to say thank you for giving me hope. Thank you. Your voice is powerful. It makes a difference. You are helping me glimpse what it might like to be on your inside. Perhaps the more I can understand, the bigger the difference I can make too.